Torment Kickstarter Update #11: Nathan Long, Unified RPG Engine, Second City, and 2D Backgrounds! 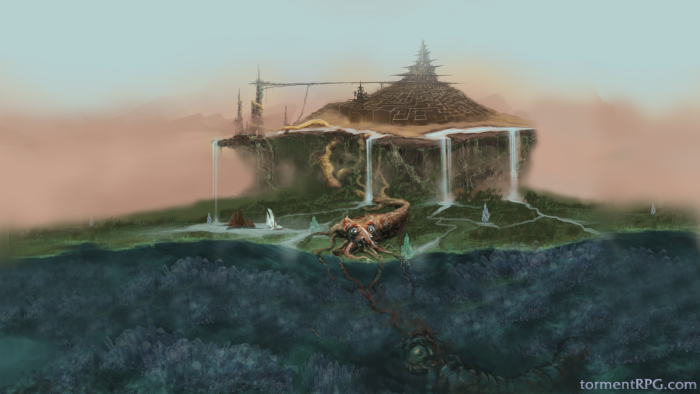 Today's Torment: Tides of Numenera Kickstarter update is the most exciting one in a while. As usual, there's a new episode of the Torment video series. This one features writer Nathan Long, who is a pretty cool guy. He takes the various elements discussed in the previous episodes and puts them together to create an example of a typical Torment quest scenario. For future videos, inXile have opened a Q&A section in the official Torment forums. Colin McComb will answer the most popular questions posted. In addition to that, inXile have added the option to unlock an additional bonus Fathom if 10000 people like Torment's Facebook page. Oh boy! It's interesting that Torment and Project Eternity will end up sharing the same code, kind of like how the original PS:T used Baldur's Gate's code. And that second city will put Torment on par with Project Eternity (which also had a second city stretch goal) in terms of size and scope. Hopefully this will bring on a surge of increased pledges. If you're not personally interested in any of the high tiers, might I suggest you do so via our fundraising campaign? There are 90 comments on Torment Kickstarter Update #11: Nathan Long, Unified RPG Engine, Second City, and 2D Backgrounds!